Six to ten thousand shipwrecks in the Great Lakes, three thousand in Lake Michigan and three hundred in Lake Michigan’s southern basin. Those were the estimates given by Jim Jarecki, President/Archivist of the Underwater Archaeological Society of Chicago at the March meeting of the Duneland Historical Society. He was joined by Mike Escher who works with the Underwater Science Program at Indiana University Bloomington. 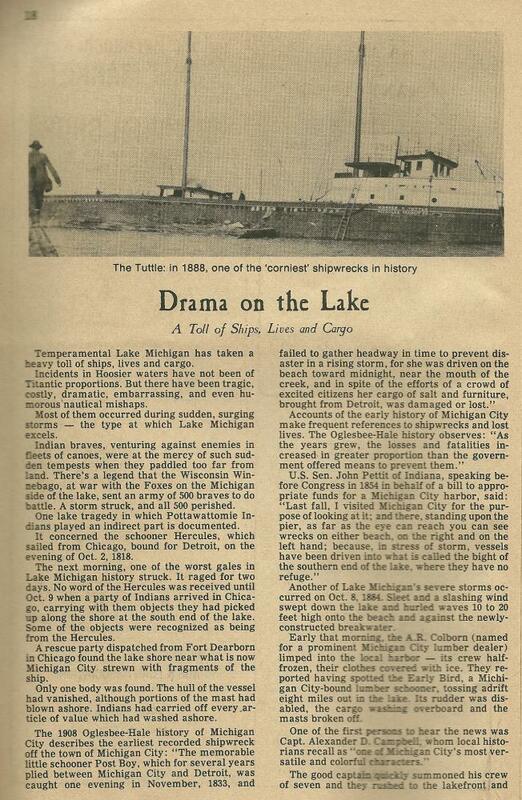 The program titled “Shipwrecks and Marine History of Southern Lake Michigan” included stories of many wrecks located in the Indiana and Illinois waters of Lake Michigan. Both men talked about the ongoing study and research taking place at the site of a shipwreck off Ogden Dunes. An unknown ship is sometimes visible off Shore Drive and people have reported seeing it as long ago as the 1930s. Fluctuations in lake levels cause it to disappear or be covered with sand. Pictures showed what could be mistaken for the remains of a dock or pier extending out into the lake. It is 86 to 90 feet long and is known as No. 4 wreck for lack of identification. There is wool felt material throughout the wreckage and some speculate that it was used in the lumber trade. 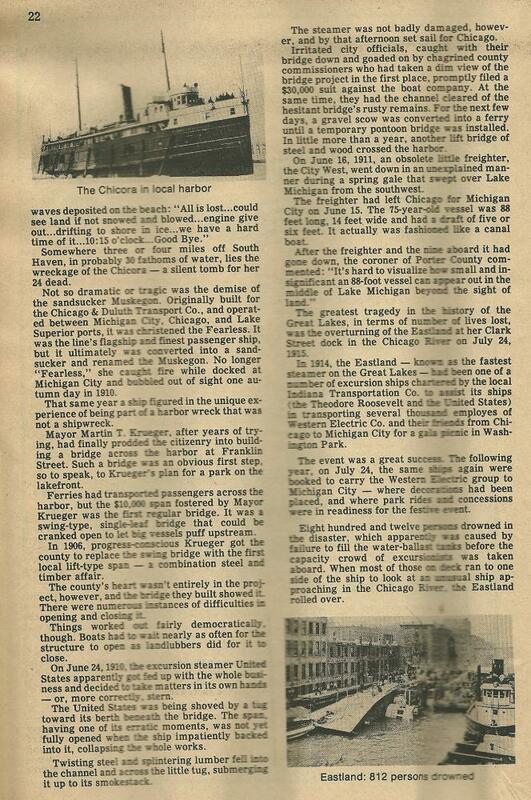 The best known wreck is the Eastland which tipped over at the dock in Chicago when loaded with employees of Western Electric and their families preparing to go to Michigan City. It occured on July 24, 1915 with a loss of life of more than 800. In connection with the story of the Eastland disaster the name of Lodner Phillips of Michigan City comes up. He was a shoemaker and inventer who built the first Great Lakes submarine in the mid 1800s. When the clean-up was underway after the Eastland capsized a submarine was discovered called the Fool Killer which had been built by Phillips. Among wrecks described was the steamer Lady Elgin which went down September 9, 1860. It was a luxurious passenger boat and was carrying members of the Union Guard on a trip from Milwaukee to Chicago to hear Stephen Douglas speak. About 300 people died and wreckage was strewn for miles along the lakeshore near Winnetka, Illinois. •Side wheel Eureka lost in 1873 off Michigan City. •Passenger sailing ship David Dows which sank on Thanksgiving Day of 1880 off Whiting. •F. W. Wheeler down 3 miles east of Michigan City in 1893. •J. D. Marshall wrecked near the dunes on June 11, 1911 with four men lost. •The George F. Williams wrecked near Hammond in 1915. Jarecki’s organization works with the Shedd Acquarium and the Chicago Historical Society and does a lot of public outreach with youth groups. He ended his program with the statement that Indiana historical shipwrecks should be managed for this and future generations. The Duneland Historical Society will meet April 19 at 7:30 p.m. when the program will be “On the Home Front: Chesterton and Porter During WWI” by Matt Hedstrom, Lilly Fellow and Lecturer in Humanities and American Studies at Valparaiso University. DHS members will meet for dinner at 6:30 p.m. prior to the program. 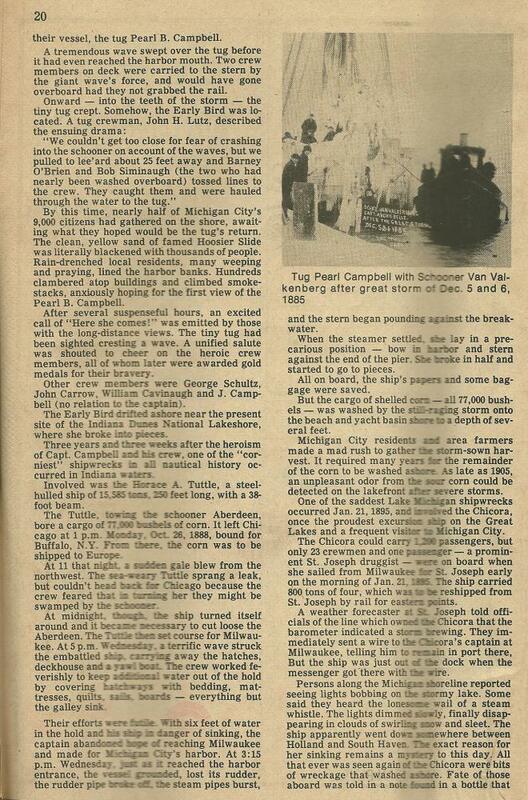 Editor’s note: The sinking of the J. D. Marshall north of Chesterton in 1911 was covered in detail in the Chesterton Tribune. 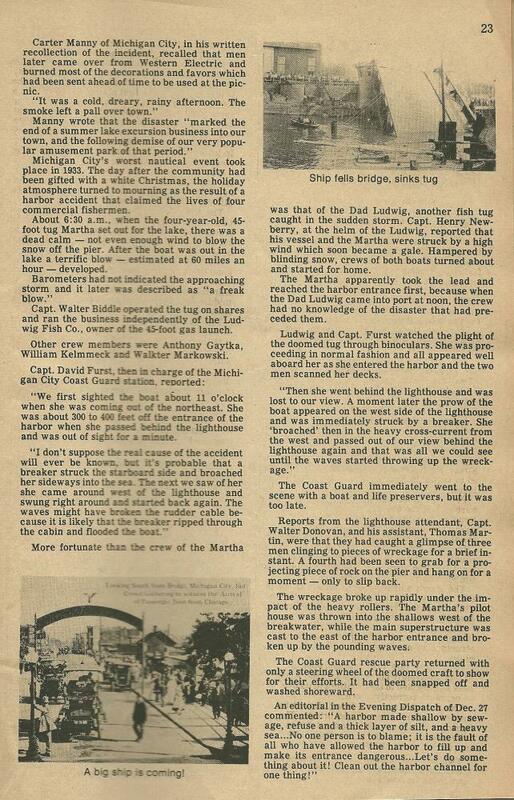 On June 15 the paper reported that the sand barge J. D. Marshall had taken on a load of sand and when attempting to return to deeper water had sprung a leak, listed and capsized. Four men were lost and six were rescued with help from local fisherman Richard Sabinski. One body was recovered that day and divers attempted to recover the other bodies with no success. The bodies later washed ashore and were found by Sabinski who had been keeping watch. It was noted that bodies from the Lady Elgin disaster near Winnetka in 1860 had washed up in nearly the same spot.